White paper on crime 2004 Part4/Chapter2/Section3/3. Fig. 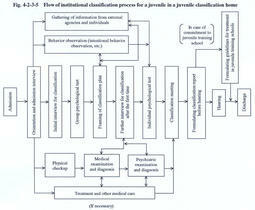 4-2-3-5 illustrates the flow of regular classification process for juveniles under protective detention(hereinafter referred to as"Institutional Classification").The examination for institutional classification consists of interview,physical checkup,psychological test,psychiatric examination and diagnosis,behavior observation,and the gathering of information from related organizations and family members etc.Information obtained in the course of such examination is brought together at a classification meeting consisting of the director of the juvenile classification home,staff in charge of classification,and others.The aim of the meeting is to identify the characteristics and problems of the juvenile,factors leading to delinquency and the risk of recurrence of delinquency.Then,the most appropriate treatment for the juvenile's improvement and rehabilitation is adopted as the opinion based on the classification.The opinion is summarized in a classification report and presented to the family court prior to the hearing. The result of classification is recorded in a Juvenile Book along with other records,and if an adjudication of protective measures is made,is sent to a juvenile training school or probation office etc.If a juvenile is to be committed to a juvenile training school,guidelines for treatment are formulated and sent with the juvenile to a training school to facilitate the planning of the individual treatment program. Table 4-2-3-6 shows the relationship between the recommendation based on classification and dispositions by family courts in2003.Among the juveniles for whom non-institutional treatment(mainly probation)was recommended,83.7%were subjected to probation,while9.1%were placed under tentative supervision by family court probation officers with suspended disposition.As for those juveniles for whom commitment to juvenile training schools was recommended,55.8%were actually sent to training schools,but25.3%were placed on probation and14.3%under tentative supervision.For those who were considered to be inappropriate for protective measures and referral to a public prosecutor was recommended,54.3%were referred to a public prosecutor. Other than institutional classification,juvenile classification homes carry out the following classification activities. Non-institutional Classification is conducted by summoning a juvenile to a family court or a juvenile classification home etc.without admitting him or her to a juvenile classification home.Examination for classification is mostly conducted through interviews and psychological tests.The result is summarized in a classification report and submitted to a family court in the same way as institutional classification. -Public prosecutor:mostly summary expert examination on a juvenile at the stage of criminal investigation. -Penal institution:mostly classification on a juvenile under16who was sentenced to imprisonment with or without labor in order to contribute to the execution of his or her sentence. -Juvenile training school:mostly re-classification on a juvenile to review his or her problems to change his or her treatment plan. -Regional Parole Board and probation office:mostly classification of juveniles necessary for parole hearings or the implementation of supervision. Classification services for the general public is conducted at the request of citizens,public and private organizations etc.,in order to help decision-making on education,vocational guidance and other matters of juveniles in the society at large.Through such activities,juvenile classification homes play the role of juvenile guidance centers in local communities,respond to the needs of the general public,and contribute to the sound development of juveniles and the prevention of juvenile delinquency. 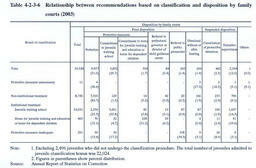 In2003,the total number of juveniles accepted for classification was54,693,of which23,549were for institutional classification,820for non-institutional classification,eight for prosecution,1,690for penal institutions and juvenile training schools,9,089for probation and parole,and19,537for the general public(Source:Annual Report of Statistics on Correction). Protective detention:Protective detention is a measure taken by a family court to secure the custody of a juvenile for whom a hearing needs to be conducted.There are two types of protective detention.The first type places a juvenile under the protective detention of a family court probation officer,whereas the second type places a juvenile under the protective detention of a juvenile classification home.The latter type of protective detention not only secures the custody of a juvenile but also offers a classification examination on his or her mental and physical conditions.